An elegant town of old coaching inns, timbered cottages and historic redbrick buildings. The old town retains much of its former charm. The main highway (the A40, now bypassed by the M40), is bordered by many fine Queen Anne and Georgian houses. The town also has is a pleasant residential area with several tree-lined streets of fine Victorian and Edwardian houses. 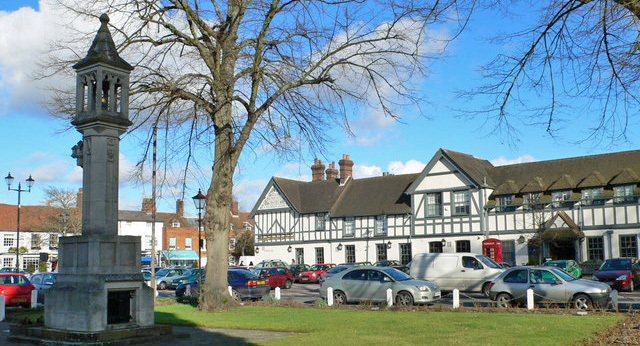 During the 17th century Beaconsfield was an important staging post along the London to Oxford route (A40). Some of the old coaching inns from this period still survive, including the half-timbered Royal Saracen's Head (shown above) and the Royal White Hart, where Elizabeth I once stayed and where Olive Cromwell stationed his troops during the Civil War. The town has expanded dramatically since this time, encouraged by the arrival of the railway in the late 19th-c. The town's best known resident was Benjamin Disraeli (1804 to 1881), the Earl of Beaconsfield and two-time Prime Minister of Great Britain. His opulent red brick mansion, Hughenden Manor, can be visited to the west of the town. Edmund Burke, the great parliamentarian, also lived in the village and was buried in the parish church in 1797. The flint and Bath stone parish church of St Mary & All Saints has a fine 15th-c pinnacled tower. Within are memorials to Edmund Burke and also Edmund Waller the poet. The half-timbered rectory, overlooking the churchyard, is 16th-c. The beautifully beech-wooded hills of the Chilterns surround the town, a great area for rides and country walks. Just to the south lies Burnham Beeches and Stoke Common, two dedicated areas of leisure and relaxation for all to enjoy. 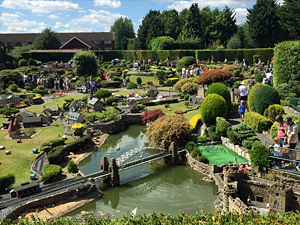 Bekonscot Model Village, has delighted children and visitors since 1929. One of the oldest in the world, it has miniature houses, shops, churches and castles all built to 1/12 scale. Working models include an airport, docks, fun-fair and a five station model railway.